Various planetary terrains or asteroids, which are hard to traverse with wheeled platforms, are expected to be explored. Bekker’s model cannot be applied to estimate the motions of rovers without wheels, such as the hopping rover (hopper). In this paper, the resistive force theory (RFT) approach is introduced. This approach is not based on Bekker’s model, and is expected to apply to any platform. However, this RFT approach only applies to static or quasi-static motion, such as in the case of slow motions. To apply the RFT approach to dynamic motions, such as hopping, the effect of velocity as a dynamic variable is also studied. Through the hopping experiments, the effectiveness of RFT with the velocity-term approach is investigated and compared to the RFT approach. K. Sakamoto, M. Otsuki, T. Kubota, and Y. Morino, “Hopping Motion Estimation on Soft Soil by Resistive Force Theory,” J. Robot. Mechatron., Vol.29, No.5, pp. 895-901, 2017. W. D. Carrier, “Soviet rover systems,” AIAA Space Programs and Technologies Conf. (Huntsville, AL), p. 8, 1992. V. Asnani, D. Delap, and C. Creager, “The development of wheels for the lunar roving vehicle,” J. of Terramechanics, Vol.46, No.3, pp. 89-103, 2009. E. Lakdawalla, “China lands on the moon,” Nature Geoscience, Vol.7, No.2, pp. 81-81, 2014. B. Wilcox and T. Nguyen, “Sojourner on mars and lessons learned for future planetary rovers,” tech. rep., SAE Technical Paper, 1998. S. W. Squyres, R. E. Arvidson, E. T. Baumgartner, J. F. Bell, P. R. Christensen, S. Gorevan, K. E. Herkenhoff, G. Klingelhöfer, M. B. Madsen, R. V. Morris et al., “Athena mars rover science investigation,” J. of Geophysical Research: Planets, Vol.108, No.E12, 2003. R. Welch, D. Limonadi, and R. Manning, “Systems engineering the curiosity rover: A retrospective,” IEEE Int. Conf. on System of Systems Engineering (SoSE), pp. 70-75, 2013. T. Yoshimitsu, “Development of autonomous rover for asteroid surface exploration,” IEEE Int. Conf. on Robotics and Automation (ICRA), Vol.3, pp. 2529-2534, 2004. 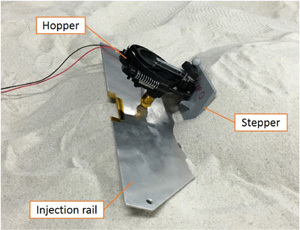 S. Ulamec, V. Kucherenko, J. Biele, A. Bogatchev, A. Makurin, and S. Matrossov, “Hopper concepts for small body landers,” Advances in Space Research, Vol.47, No.3, pp. 428-439, 2011. R. Jaumann, J. Bibring, K. Glassmeier, M. Grott, T. Ho, S. Ulamec, N. Schmitz, H. Auster, J. Biele, H. Kuninaka et al., “A mobile asteroid surface scout (mascot) for the hayabusa 2 mission,” European Planetary Science Congress, Vol.8, p. 594, 2013. R. G. Reid, L. Roveda, I. A. Nesnas, and M. Pavone, “Contact dynamics of internally-actuated platforms for the exploration of small solar system bodies,” Int. Symposium on Artificial Intelligence, Robotics and Automation in Space (i-SAIRAS), (Saint-Hubert, Canada), p. 9, 2014. B. Clark, J. Sunshine, M. A’Hearn, A. Cochran, T. Farnham, W. Harris, T. McCoy, and J. Veverka, “Comet hopper: A mission concept for exploring the heterogeneity of comets,” Asteroids, Comets, Meteors 2008, Vol.1405, 2008. D. Mège, J. Gurgurewicz, J. Grygorczuk, Ł. Wiśniewski, and G. Thornell, “The highland terrain hopper (hopter): Concept and use cases of a new locomotion system for the exploration of low gravity solar system bodies,” Acta Astronautica, Vol.121, pp. 200-220, 2016. M. G. Bekker, “Off-the-road locomotion: research and development in terramechanics,” University of Michigan Press, 1960. J. Y. Wong, “Theory of ground vehicles,” John Wiley & Sons, 2001. A. Reece, “Principles of soil-vehicle mechanics,” Proc. of the Institution of Mechanical Engineers: Automobile Division, Vol.180, No.1, pp. 45-66, 1965. G. Meirion-Griffith and M. Spenko, “A modified pressure-sinkage model for small, rigid wheels on deformable terrains,” J. of Terramechanics, Vol.48, No.2, pp. 149-155, 2011. C. Li, T. Zhang, and D. I. Goldman, “A terradynamics of legged locomotion on granular media,” Science, Vol.339, No.6126, pp. 1408-1412, 2013. J. Lighthill, “Mathematical biofluiddynamics,” Regional Conf. Series in Applied Mathematics, Vol.17, Society for Industrial and Applied Mathematics, 1975. T. Zhang and D. I. Goldman, “The effectiveness of resistive force theory in granular locomotion,” Physics of Fluids, Vol.26, No.10, p. 101308, 2014. T. Zhang, F. Qian, C. Li, P. Masarati, A. M. Hoover, P. Birkmeyer, A. Pullin, R. S. Fearing, and D. I. Goldman, “Ground fluidization promotes rapid running of a lightweight robot,” The Int. J. of Robotics Research, Vol.32, No.7, pp. 859-869, 2013. S. R. Waitukaitis and H. M. Jaeger, “Impact-activated solidification of dense suspensions via dynamic jamming fronts,” Nature, Vol.487, No.7406, pp. 205-209, 2012. H. Katsuragi and D. J. Durian, “Drag force scaling for penetration into granular media,” Physical Review E, Vol.87, No.5, p. 052208, 2013. P. Umbanhowar and D. I. Goldman, “Granular impact and the critical packing state,” Physical Review E, Vol.82, No.1, p. 010301, 2010. J. Aguilar and D. I. Goldman, “Robophysical study of jumping dynamics on granular media,” Nature Physics, 2015.